.23 Months since the Fall of Usamilplatz. 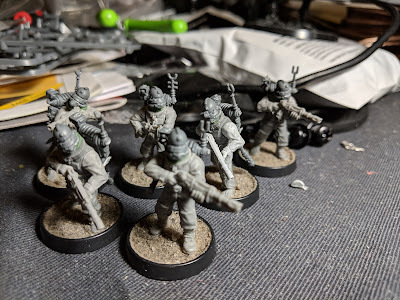 With the Maniples of Prima Jama's Skitarii embarked upon increasingly heavy fighting across the breadth of the offensive area around Usamilplatz and with the alien's attempted breakthrough on the extreme right of the Imperial line only barely rebuffed with extreme casualties. MQC 87-C* in control of the PDF and Astra Militarum elements within the surrounding areas looked to stymie any potential flow of new Ork warbands into the region. With most of 1AG's regiments already embarking on a campaign of retaking major automotive roadways and mag-lev lines through the Eastern ranges of the Usamiljen Mountains, assets were already in a position to be moved quickly to act as blocking forces. 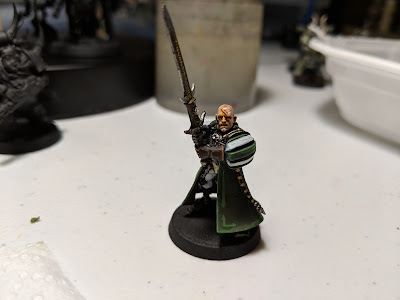 The 334th Idrian "Ghosts" Irregulars, were just one of 3 Regiments moved to act in this capacity. Understrength after sustaining casualties clearing out villages in the vicinity of the Ork Exclusion Zone east of Kula Hive, the 334th was acting in a support role to the 1st Usamiljan Fusilier Cohorts' "Operation Vengeful Deliverance", this being their recapture of the city of Saltzkost, along a major highway running southbound into the lowland regions of northern Kula Province. The Regiment was moved into a 60 Km mountain pass, blocking a tertiary highway which runs into the southeastern edge of Korsnokrat. 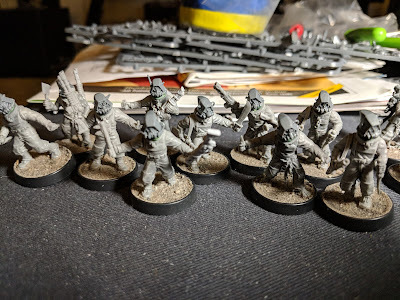 While the Orks in the Saltzkhost operational area's eastern reaches were expected to deploy only noncommital probing assaults until the city was retaken (the aliens holding the city represented a rival warband to those positioned in the foothills east of the city.) 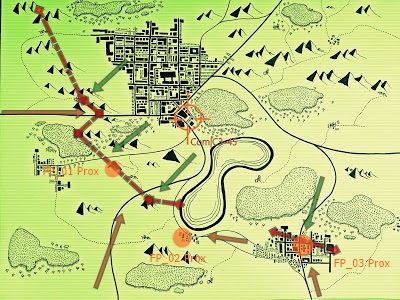 the counter-offensive launched haltingly in the wake of the Emerald Screen incident would spur the orks into a frenzy and all three units occupying the Saltzkhost operations area were battered with waves of light infantry and vehicles for several weeks. About a month after the Emerald Scream, greenskin forces within the Usamilplatz region gained a great deal of tactical coordination, at odds with trends extrapolated by IntRec for those xenos formations. The ensuing attacks within Usamilplatz and Korsnokrat which resulted in the death of multiple Skitarii Magos and the routing of PDF and Mechanicus forces has already been recorded. But in Saltzkhost, Ork Motorized forces advanced into the understrength 334th, no doubt under orders from their unknown warlord to link with their comrades expected to break through the Imperial defenders of Korsnokrat. 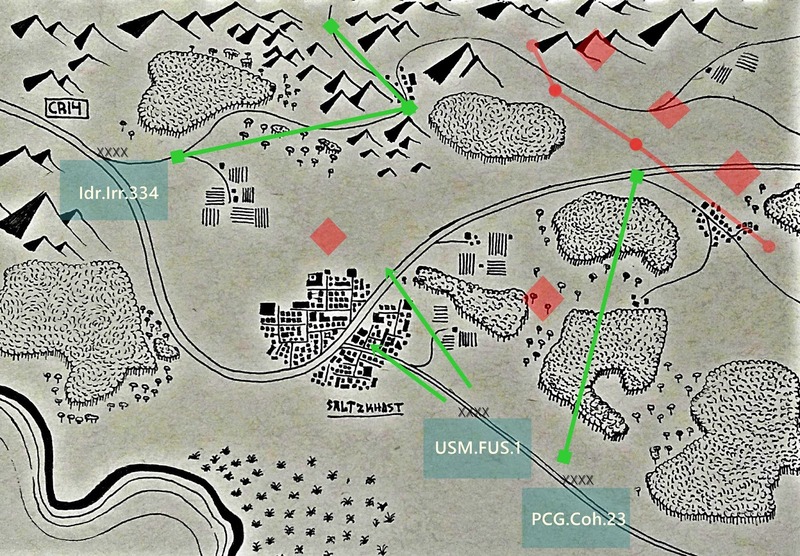 The Regimental headquarters of the 334th was Bastion W542, this position would come under no less than 21 successive waves of greenskin's before the end. At the height of the attack, when 8 of the regiments 12 companies had already been destroyed, the regiment was reinforced by members of the Sons of Medusa's Warclan Megara reserve assets. They would join the remnants of the regiments command bastion garrison in their final charge, to buy time for the remaining companies to withdraw and link with units in southern Korsnokrat. 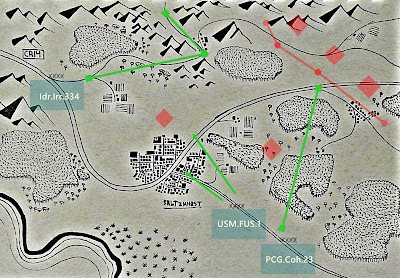 The Fall of bastion W542 would be the final resistance preventing the ork reserves in Saltzkhost from sweeping north into the southern flank of the already depleted Imperial forces in Korsnokrat. 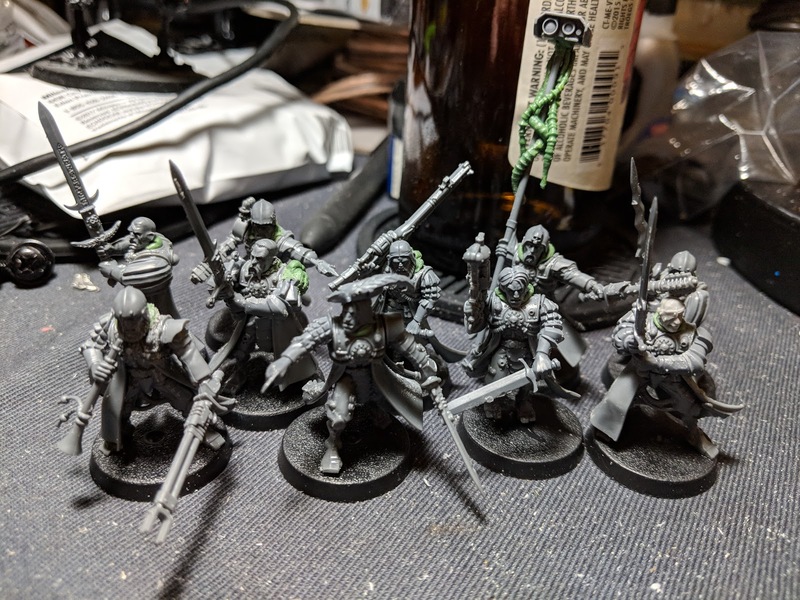 While all members of the 334th conducted themselves with honor in the field, it changed little in the bearing that the Mechanicus line in Usamilplatz was in dire straits of being rolled up from the south by Ork motorized units. Only steadfast resolve, and a great deal of ammunition would save the Imperium's soldiers and allow them to continue to hold the line. Thanks for reading! This post was a part of an ongoing narrative campaign, in the "living setting" of Jornath. 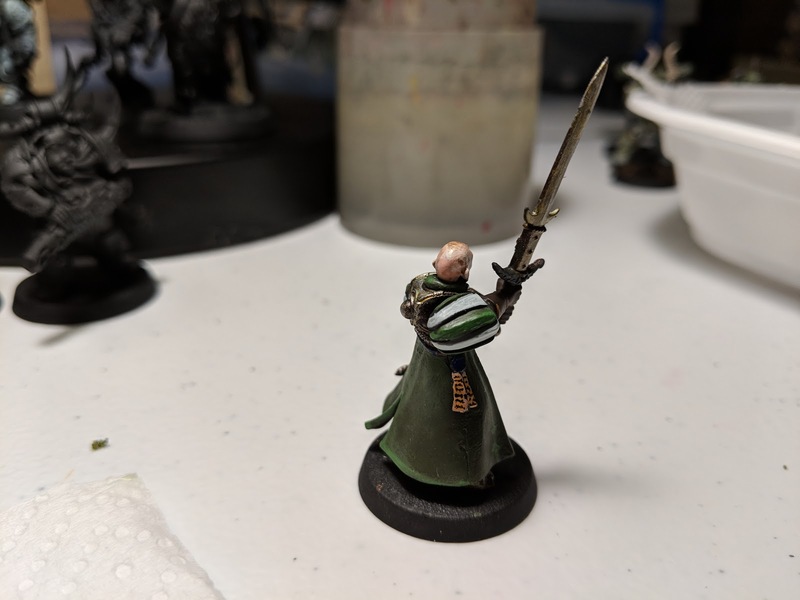 For more information about Jornath as a setting, including units, missions, and posts from other Jornath bloggers be sure to click on the Jornath [40k] tab at the top of this page for an up to date list of all posts. 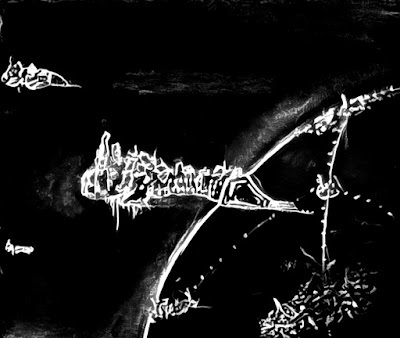 Lugon gripped tightly to the railing encircling his command dias at the center of the ship's bridge as another barrage of ork fire hammered into the hull. Sparks showered out from some vital system above him, the rain of fire accompanied by the flickering of cogitator screens and the distant screaming of ratings. "STATUS" he bellowed to Defense Officer Hadris. "Crash Teams deployed to Decks 20-24, sections open to vacuum along Enginarium 1 and 3, Ignatius Fury is listing hard and burning, Mortis Nobilum reports they are moving to engage." reported the thickly bearded officer in the clipped cadence of the navy. "Damnable Greenskins" Lugon hissed under his breath, the fleet had slammed into the aliens' cursory forces above Ankou's capital, Linces Hive and as was to be expected the xenos had returned the engagement with gusto, but what gusto it was. He had fought pirates in the rim worlds with the System fleet, tenacious and cutthroat men, gripped with desperation and a wealth of ill-gotten weaponry. They had been close run times, but this was something new altogether, pirates had a quantifiable boundary for violence and would surrender given enough void torpedos and lance battery strikes, but orks? Of the three dozen vessels above Linces Hive, only 4 still remained, outnumbered ten to one by the massed ships of the Imperial Navy, Adeptus Astartes, and Ark Mechanicus, the ork juggernaughts had blazed away in all directions with a blizzard of fire of such magnitude that it was nearly impossible to tell where the spotting fires of damage ended and the white glow of gun batteries began. He furrowed his brow, and stared at the flickering hololithic display on his dias, many of the system fleet vessels, which had been in the vanguard, were already limping out of the immediate danger posed by the alien ships. The Mortis Nobilum a strike cruiser from the Imperial Dragoons chapter had moved to their support and was hammering the Ork Kroozer currently firing upon the ship. He closed his eyes and slowly breathed in the smoke-stained air, before making the most difficult decision of his life. "Bring us around again, prepare the gun crews for another run in!" He declared to the bridge crew sternly. 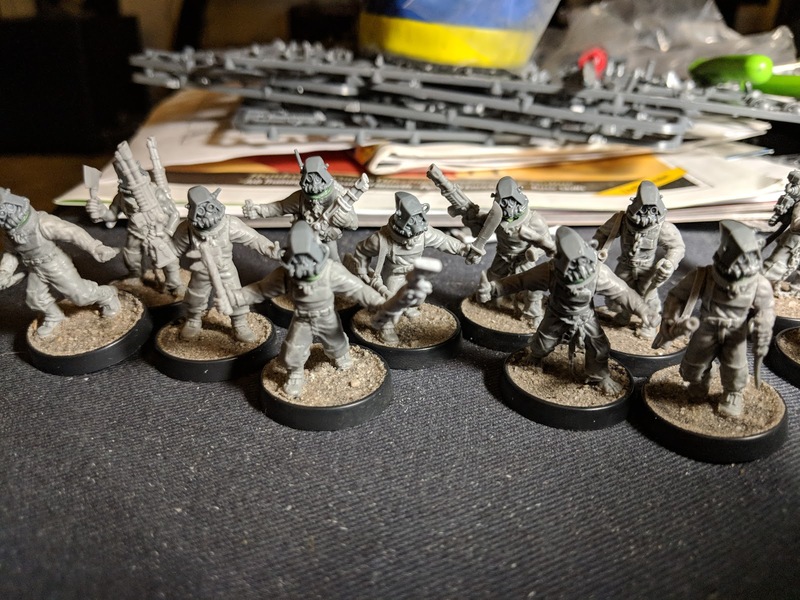 The three dozen officers sat in shocked silence, their terrified, wide-eyed faces, soaked with sweat and ash, looked like a sardonic parroting of the Ork's themselves in the green glow of their screens. After a short pause, the Helmsman, Tenric Cessaire, got to his feet, straightened his jacket and in a shaky voice addressed Lugon. "Sire, prow shielding is faltering, we are venting atmosphere in multiple places, We may not endure another attack run. I urge you, please for the good of the crew, allow us to return to the second line, allow us to preserve the ship!" 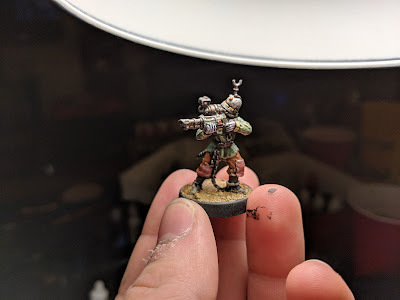 finished Cessaire. The ship rocked again, more gently this time, as a torrent of small bore missiles glanced off the hull, only serving to strengthen the helmsman's argument as far as the rest of the bridge crew was concerned. "The Emperor's Angels are present on the field, and whats more have come directly to our aid. I will not embarrass the system fleet by abandoning them. Nor will I turn tail and run while an alien vessel still sits polluting Jornathii Space. We will go forward, my decision is final Cessaire. Full speed ahead." He stated, as calmly and in as commanding a voice as he could manage as he suppressed the fear rising inside him. "Aye Sir." Cessaire replied raggedly, sitting back down at his station, he engaged what power could still be nursed from the surviving engines and the Sarans Farewell began its approach to firing range once more. As the ship powered its way forward, Lugon watched as the final few layers of prow shielding were torn away by the weight of the alien's fire. He barely heard Hadris' panicked reports of hull integrity, he continued to stare intensely at his hololithic display, the Mortis Nobilum was just entering into its broadside sweep. The Ork vessel had taken a beating, regardless of its ferocious lashing out, it was close to death, its crude flickering void shield cast a crackling net of orange light across its hull. But the many guttering fires across its breadth were evidence enough that it was beginning to falter. 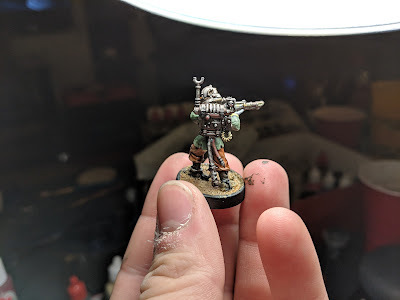 If Lugon had estimated things properly, and he was bargaining everything that he had, the combined broadside of both his ship and that of the Mortis Nobilum would be just the thing to overwhelm the Ork shielding and crack the berzerk kroozer once and for all. He watched transfixed at the display, as the icon of the ship moved closer, and closer to the pale yellow circle surrounding the marker for the alien ship. Never in all his life had he thought that a handful of holographic polygons could absorb him so completely, harnessing an impossible potential for hope and dread in equal parts. When finally they fell within the encompassment of that yellow circle, he screamed out his order. He had yelled the words with such a great strain that he could feel the faint wet tang of blood and mucus in his throat, even with that effort though, they had almost been drowned out by the sure cacophony of the bridge as the ship groaned like some great dying beast, its frame melting from the heat of massed laser weapons fire and cascades of torpedo hits buckling across the whole of the ships starboard side. Power failed totally on the bridge then, only emergency life support still functioned, and even that was stammering. The sound and light and violence were at once replaced by an eerie tomb-like silence for a moment before the crackling sound of fires and the groaning choir of wounded men drifted in. Seconds past, filled only by piteous cries and the dancing light of electric fires. Seconds gave way to minutes, filled with more of the same. The creeping dawn of excited hope began to claw its way up through Lugon's stomach and scratchy throat. The power flickered back for an instant, before dying once more, but it had been enough for him to see what he needed. The yellow circle was gone, gone because there was no more need to measure proximity to a target that did not exist. He was beside himself with relief, he slumped down to the deck next to the hololith displayer and smiled. 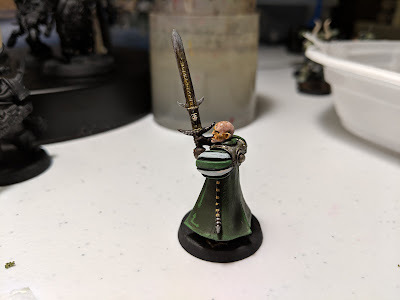 "Jornathii Vendratus, you green bastards" he rasped to no one in particular. All is not well on the surface of Ankou, its population infected by a psychic scrap code leading vast tracts of its enslaved augmetic population to revolt against their masters. 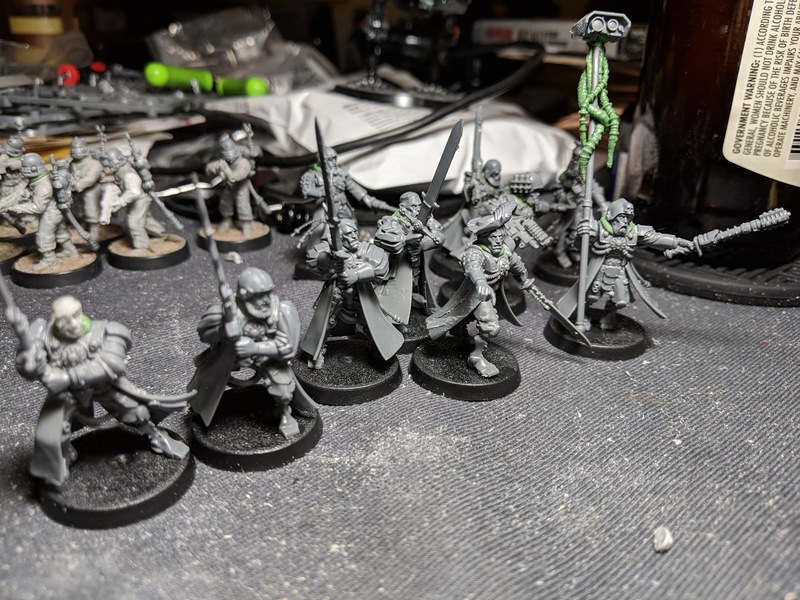 The traitorous hordes of Jornath's mining moon grow larger. I hope you have enjoyed the look at them.